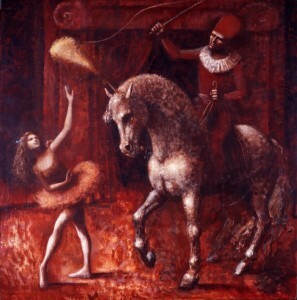 The featured painting for August 2011 is entitled “Circus Scene”. 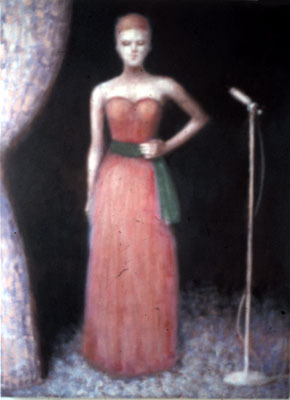 Ian did a small and medium version of this painting plus many renderings of it which can be view in the archive in the album London 1985-1989. The painting currently resides in Northern Ireland. Below is a poem written by Lorna Stevens - a friend of Ian’s from Northern Ireland who held a small memorial service for Ian in July 2011. Then gently descending into warm shallow water and lapping waves. To scatter some of Ian’s ashes in the Irish sea. A faint scent of sacred incense in the dust. His laughter at life’s absurdities. Later, the visceral terrors of a broken body. The spiritual succour of Art. The enchantment of images and words. One at the beginning, one at the end. Paying homage to an impossible man. Lorna Stevens-Drainsbay-Northern Ireland, 20th July 2011.